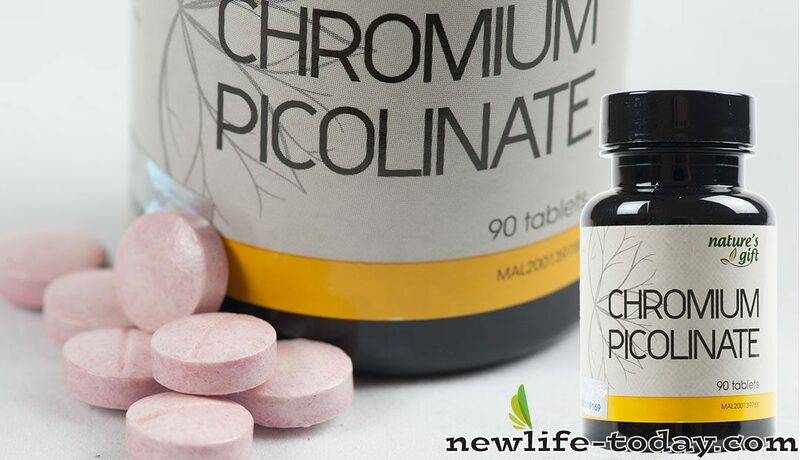 Buy this Chromium Picolinate at RM 90.00 (20% off retail) when you become a member of NewLife International. The mineral no body can afford to lose. Chromium, like iron, copper, and zinc, is one of 16 essential trace minerals your body needs to keep healthy and fit. And for people who are overweight and out of shape, chromium may be the most precious mineral of all. Is Chromium Important To Good Health? Like all of the other vitamins, mineral, and trace elements, optimal amounts of Biologically Active Chromium (BAC) are absolutely essential for good health. BAC’s physiological role is to ensure that the hormone insulin works efficiently. Without the least minimal amounts of BAC, insulin doesn’t work at all. Insulin’s primary functions are to regulate the metabolism of blood sugar, lipids (fat and fat-like substances such as cholesterol), and protein. Insulin is also involved in the neurotransmitter synthesis and in the efficient functioning of the body’s disease-fighting mechanism, the immune systems. Many scientists believe that BAC is essential for all insulin’s many important functions; BAC is a co-factor for insulin and is thus critically important to good health. In its biologically active form, chromium helps insulin metabolize fat, turn protein into muscle and convert sugar into energy. In fact, chromium-activated insulin increases the amount of glucose available for energy production nearly twentyfold. In other words, it helps optimize energy output so you feel healthy and alive. What Else Does Chromium Do? Helps control blood sugar and cholesterol, curbs cravings and fights obesity. The trace mineral chromium is an essential component of glucose tolerance factor (GTF). Chromium Picolinate provides beneficial dietary support for blood sugar regulation, keeping your blood levels balanced in-between meals so you are less likely to snack. A deficiency in chromium results in glucose intolerance. Chromium contributes to the prevention of adult-onset diabetes. It might also facilitate the binding of insulin to the cell membrane. It has been shown to decrease sugar cravings and is considered an effective treatment for both hypoglycemia and diabetes by improving glucose tolerance, increasing cell sensitivity to insulin and reducing circulating insulin levels. Recent studies also point to chromium supplementation as a potential treatment for acne. People with severe forms of acne are thought to have a low glucose tolerance / or insulin insensitivity of the skin. Research also indicates chromium’s role in lowering total cholesterol, LDL cholesterol and serum triglyceride levels and improves the LDL-to-HDL cholesterol ratio, according to Dr. Jeoffry Gordon in San Diego, California. Subsequent research supports this and suggests a greater role for chromium in the treatment and prevention of high cholesterol and cardiovascular disease. The supplement form chromium picolinate has gained attention because of its body composition benefits. In other words, it helps improve the physique by decreasing total body fat and maintaining or increasing lean body mass. Don’t I get enough chromium in my diet? U.S Government studies show that the diets of nine out of ten Americans are deficient in chromium, containing less than the minimum safe and adequate amount established by the Nutritional Research Council (50-200 micrograms / day). Further, there is a general deficiency of chromium in the soil contents, especially in Asia. The problem is even worse for dieters who restrict their calories and reduce their nutritional intake. The same goes for athletes whose nutritional requirements are greater than most people. Food processing also removes up to 80% of the chromium in foods, and less than two percent of dietary chromium is actually absorbed. Even by eating well, it is difficult to replenish depleted chromium stores. How can I increase my chromium intake? Foods rich in biologically active chromium (the form that activates insulin action) are Brewer’s yeast, black pepper, liver and wheat germ. But even Brewer’s yeast, the richest known source of biologically active chromium in nature, contains only a few micrograms of chromium per gram. Less than 10% of this is in biologically active form. Higher potencies of biologically active chromium are available in Chromium Picolinate which is absorbed significantly better than ordinary dietary chromium. No, they’re not the same as Chromium supplements vary widely in bio-potency – up to fiftyfold difference. Inorganic chromium chloride, the most common chromium supplement, is absorbed less than two percent and has practically no effect on insulin. Many people, especially seniors and diabetics, have difficulty converting inorganic chromium into a form the body can use. Chromium Picolinate, a chelated complex of chromium, however, consists of Biologically Active Chromium (BAC), an organic form which is readily usable by the body.